Dong Hyun Kim is back on the winning column. The South Korean was impressive when he faced Josh Burkman in the undercard of UFC 187: Anthony Johnson Vs. Daniel Cormier at the MGM Grand Garden Arena. He finished Burkman in the third and final round via an arm-triangle choke. Before the Burkman fight, Kim lost to Tyron Woodley in August of 2014 via a brutal knockout early in the fight. Burkman, on the other hand, returned to the UFC in January of this year after a long hiatus from the company. He originally lost to Hector Lombard but this was overturned by the NSAC into a no contest (NC) when Lombard failed drug tests. In their bout, Kim and Burkman engaged each other in an entertaining affair that earned them a possible Fight of the Night honors. It was competitive but at the end it was Kim's grappling, wrestling, and judo skills that made the difference. Kim owned the first round by dominating Burkman on the clinch. 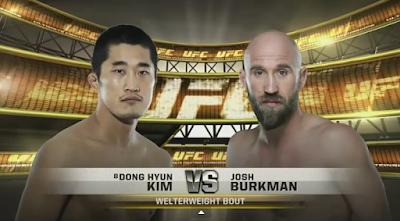 Burkman had his moments especially in the beginnings of the second and third rounds. In the third round, Burkman was able to hurt Kim and it even looked like he was going to finish him. But Kim recovered, took the fight to the ground, and worked on the submission.